Make sure you review the planning your visit section before filling out the application. Harvard Forest offers a range of amenities and activities and some of these incur a user fee. Educational Field Trips and Day Tours. 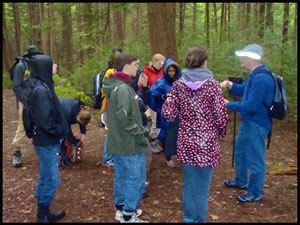 K-12 school groups, museum visitors, and field trips to Harvard Forest. Services may include guided tours and dining space. NO overnight stays. Before making a reservation, learn more about the content of a typical tour. Conferences, Workshops, and Courses. University, non-profit, government, and professional meetings and college courses. Services may include guided tours, meeting and dining space, and overnight stays. Research Project Application. Required of all scientists seeking to conduct research at Harvard Forest. Services may include use of field, laboratory, greenhouse, vehicle, maintenance, network, and housing facilities.